Two traditionally built self catering cottages. 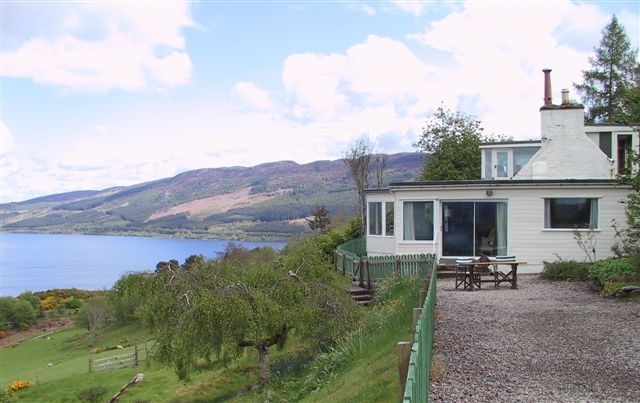 Creag nah Iolaire and Marnie’s Croft are both situated just outside Drumnadrochit in an absolutely stunning location with views over Loch Ness. We offer two self catering properties, each of the properties is unique. 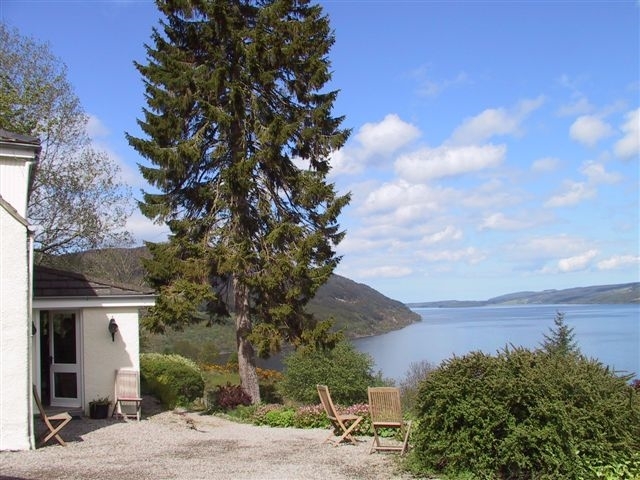 Marnie's Croft: Self Catering Cottage overlooking Urquhart Castle, Loch Ness. Marnie’s croft is a modernized croft house, now providing 4 star self catering accommodation in a unique elevated location with magnificent views overlooking Urquhart Castle and Loch Ness. The cottage is in a very private and secluded location. The attractive garden is an added pleasure with quality garden furniture provided. Roe deer and other wildlife are frequently seen in the field right in front of the house. Walks on hill tracks start from the cottage door step and you can also stroll down to the shores of Loch Ness. The nearest pub is just 1 mile and shop 1¼ miles. It is in a very private location and an ideal place to unwind! Sleeps seven - one double, two twin, and one single bedded room. There are two bathrooms, one with lavatory, basin and bath, the other with lavatory, basin and power shower. The latter is on the ground floor, and is en suite with one of the twin bedded rooms. The spacious dining room and sitting room both have superb views overlooking Loch Ness. Heating is by electricity with the addition of a wood burner which maintains a cosy, friendly atmosphere. Logs are included. Creag nah Iolaire cottage, sleeps 6 + 5 using the barn. Creag Iolaire – well named, the ‘Hill of the Eagles’ self catering holiday cottage is perched up on the side of the hill at Strone, high above Loch Ness and has unique and breathtaking views over the Loch and up Glenurquhart to the distant mountains of Glen Affric. The view is truly panoramic! There isn’t another cottage like it anywhere around Loch Ness, but don’t take our word for it - come and experience a holiday here for yourself. You can go on lovely walks straight from your door, or just spend the week drinking in the scenery. It is just a short drive to the bars, restaurants and shops of Drumnadrochit or to picnic on the shores of Loch Ness. Bed linen is provided except for towels, which are available at extra cost. Two bathrooms, one with shower/toilet & basin and which is en-suite with the downstairs double room, and one upstairs with bath/basin and toilet. The sitting room, dining and kitchen area are open plan and are in a cruciform shape. The natural maple floor is lovely and warm and spans a large area of floor space. The huge windows overlooking the loch and glen, for gazing out upon the spectacular vista, are popular with everyone! The kitchen is fully equipped, including microwave, washing machine, tumble dryer, dishwasher, fridge freezer, electric range cooker, food processor etc. Colour TV, music centre and video recorder make wet weather easier, although gazing at the view even in the rain is wonderful while you are warm and dry inside. Wood-burning stove for added atmosphere. Logs are included. Heating is by off peak storage heaters. Accessories include iron, ironing board, and hair dryer. Annexed to the property (approximately 20 yards away) is a converted barn, which can provide 'rustic' accommodation for a further five people at extra cost. The barn has a bathroom with shower, lavatory and basin. There is one double room and a large family room with three single beds. This part of the property is normally only available from May – October. If you want to bring a large party of people out of season, please ask. The barn is only let as extra accommodation for large parties staying at Creag Iolaire so your privacy is guaranteed!